Do you want to maximize storage in your warehouse? What about making the most of your valuable and expensive floor space? How do you feel about increasing your employees’ efficiency? And how about quick and easy access to your inventory? Our warehouse racking for sale can help you do all of these things. You have a storage problem, and we have your storage solution. Warehouse racks can transform your space. We have a warehouse rack for every need. We pride ourselves on providing the highest quality and lowest prices on warehouse racks. You won’t find a larger selection of new and used racks in the industry. Warehouse racks are an essential part of your warehouse operation because of their versatility. We have a large variety of warehouse racks, including pallet racks, stacking racks, tire racks, sheet racks, carpet pad racks and more! Warehouse racks are great for improving your warehouse space, but they’re also essential in keeping your people and products safe. The racks keep your heavy-duty products secure and where they belong. 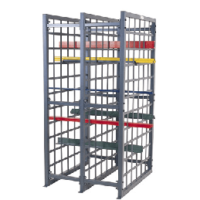 We know safety is a top priority in your warehouse, and warehouse racks can help put your mind at ease. We have extensive knowledge about all of our warehouse racking for sale, so we’ll be able to help you find the warehouse rack that’s right for you. Be sure to see what our clients have to say about our products!